Hey guys, been awhile. 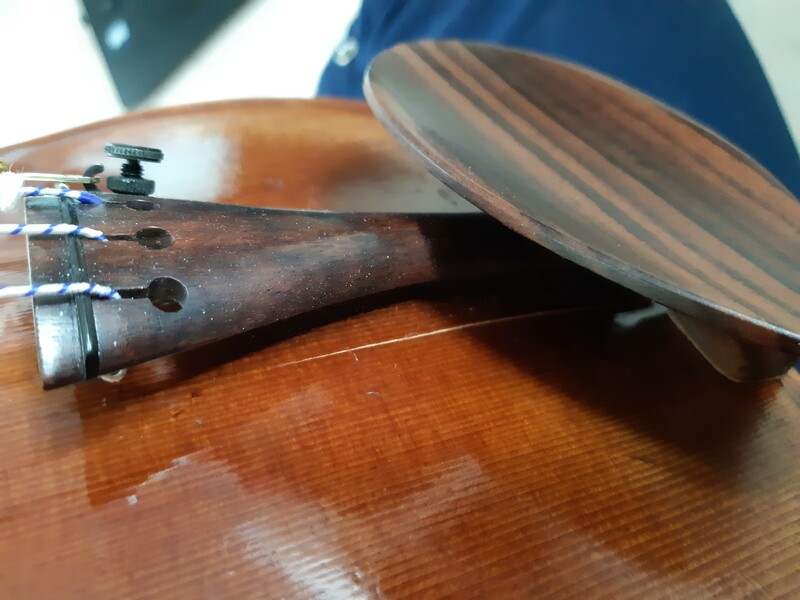 So today I picked up the violin after a couple of years not playing, and after I was done playing I noticed a crack in the top of the violin. I'm positive it wasn't there when I put it away. I'm pretty heartbroken to say the least because I was really excited about getting back into playing, and it's by far my finest violin. Not gonna lie, it was a pretty expensive one too, well at least for me. I didn't notice any weakness in sound or anything like that. So my questions is; is this a pretty easy fix, and if so, how much does it usually cost to get a luthier to fix something like this? Sorry to hear about the crack. I don’t know about the cost to fix, but certainly see a luthier for an estimate. A cheap humidifier with a little water inside (during the winter when the heater is on) will help prevent this in the future. It would depend on the luthier what it would cost (locally luthiers are pretty expensive, but it varies by location). Would be worth getting a couple estimates if there are more than one luthier near you. The crack probably happened from changes in humidity while being stored. You probably wouldn't have even thought of case humidity or lack of it if you weren't playing, but getting back into it, it would be a good idea to get one for when the furnace is running. In my cases, I always keep a case humidifier inside of it when I have to run the furnace. I personally use the Oasis. I've never had any trouble with it, and it's easy to use, to I would recommend it. Honestly, I didn't store my violin in a case, but out in the open. With humidity levels around 52% to 57% depending on the season. However yesterday I had to move my violin from my other place to this one, and the humidity level here are definitely different, although I don't know exactly the procentage it would be, coz I didn't bring my hydrometer with me. But I'll set up a proper in case humidifier now since I'll be traveling a lot with my violin and going back to school. Well, when I get it fixed that is. Now I kinda feel bad about bringing my violin, cause I'm certain it wasn't cracked yesterday before I left. I guess the case could have bumped into something during transport too. I don't know. I guess I'll have to ask around to see if I could find a local luthier that would be willing to do the repair within reasonable pricerange. Don't beat yourself up, stuff happens, I move my fiddles around a lot, especially when I used to take lessons, I'm sure all of us here drag our fiddles around quite a bit. It could have had an old hairline crack that just grew enough now to notice it. It looks straight and clean, so it shouldn't be hard at all for a luthier to repair it. Edit to add, if there is a music teacher or orchestra at your school, maybe they know of a luthier to recommend. So I spoke to my local luthier and he said the crack wouldn't be possible to fix without taking the top off, since the crack wasn't leveled on both sides. He also had to place in some reinforcement, but couldn't tell by the quick look on how the bass bar was located in relation to the crack. So the reinforcement could get a little complicated and tricky. The estimate cost about 8000 NOK (about 980 USD by current currency) and about 3 weeks to fix. Which was a pretty insane number. But it could get a little lower if the crack turned out to be easier to fix. I decided to leave my violin at the shop, hopefully the repair turns out to be beneficial in the long run. @HP I sure hope you get a pleasant surprise when your good fiddle comes back from the luthier (both in terms of the sound and the repair cost.) That spruce top, tailpiece and chinrest look lovely, indeed. @bocaholly Yeah, I hope so too. It's a lovely violin, so I don't wanna give up on it. I just hope it will be playable when I get it back. Sorry to hear about the crack and the expense. We are considerably more reasonable here at Fiddlerhop. I won't judge the shop though. Different economy, different country..... Norway is an expensive country. I remember how expensive meals were when I was on tour in Narvik. @Fiddlerman Oh I wish Trondheim was more like Narvik. You can barely get a cup of coffee for less than 7 dollars here. I get why they charge so much though, the local economy is pretty bad at the moment. A lot of shops regardless of the type of trade has to shut down. Just trying to stay alive I suppose. So it's even MORE expensive in Trondheim. OMG!! !